"In a town so saturated with gimmicky bands, it's refreshing to come upon Wiretree's honest, unironic power pop. In fact, the group's music reminds me of Big Star's "Ballad of El Goodo." The band's third LP, Make Up, contains great ditties, including the sweetly rollicking stomper "Broken Foot," the ominous-feeling "Tonight" and "Dakota" a cahartic and wonderful sample of what makes Wiretree so good. Sometimes with all the electric bleeps and bloops in music, you just want some good, honest rock n' roll." The clipped guitars and easy '70s singalong feel of the title track of Make Up sum up the engagingly out of sync feel of Wiretree's latest, a kind of prelapsarian college rock before grunge broke big and transformed expectations. In that regard, the band continues as before, but it's a case where a little can go a long way - with songs like "The Shore," another in the line of jaunty and jumping songs that have roots via Motown, the Smiths, the Strokes and beyond, the quartet can easily strike gold at its best. Kevin Peroni may hail from Austin, but his heart is in the north of England. A bit of Liverpool, a bit of Manchester and the slightest smidge of Birmingham. All in the service of good music. These peppy, poppy songs make an immediate impression. Their insistent rhythms and rollicking hooks are impossible to ignore. This may be formula fare, but it's at the highest level. The production leaves more round sounds than most popsters look for today. I like that. It gives the bass more bounce and the harmonies just that much more ring. Peroni's songs are wonderful, and the band pounds them out impressively. Try to get these songs out of your head. Bet you can't. "Echoes can be heard of everything from vintage ‘60s pop-sike and Velvet Underground-esque choogle to paisley underground-tinted ‘80s stylings and latterday indie rock with a distinctive anthemic edge. There's an urgency afoot in the Wiretree music, and a naked honesty as well." 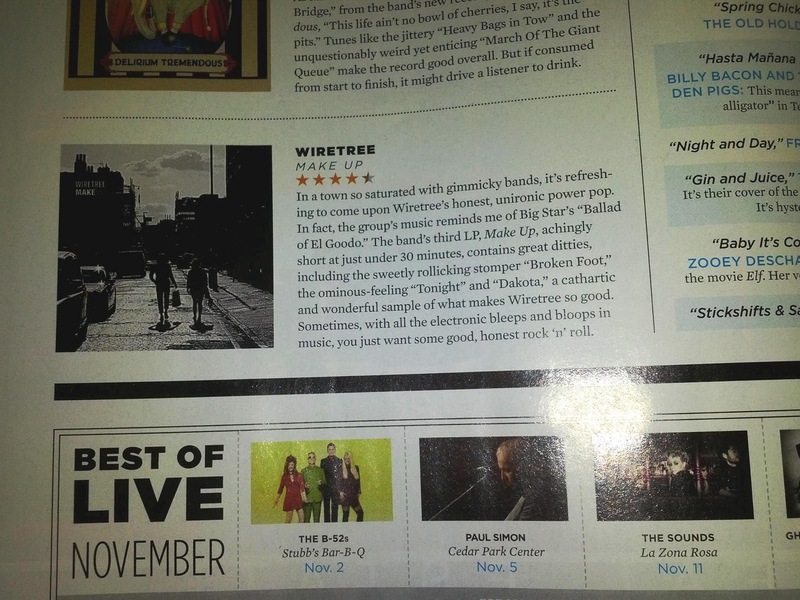 "With sophomore album Luck, Wiretree has fused inventive indie-pop instrumentals with soulful, retro-rock vocals. "Satellite Song" is a composite of electro-pop, Jeff Buckley folk and the poetic spirit of Simon & Garfunkel. The Austin, Texas, band's draw of contrasting influences has veered far away from the clutter of disjointed sounds that could so easily have resulted and instead has been able to create music that is effortlessly cohesive and somehow just makes sense." "Beside having a sure melodic touch, Peroni has the remarkable ability to absorb his influences without regurgitating them, adding to the legacy of great indie pop rather than imitating it. The proof is in this delectable pudding: Luck gets better, richer, more satisfying with every spin." "We could easily play the influence game with the Austin, Texas indie rock foursome Wiretree. There are traces of Britpop's cool factor and The Shagri-Las' lilt and sway on the piano-tinkler "Satellite Song." Despite these tap roots, this quartet of misfit lovers craft pretty dang solid pop tunes, regardless of their touchstones. Now Wiretree's preparing the way for Luck, the follow-up to 2007's quietly disarming Bouldin." "We have not been able to stop playing one of 2009's most brilliant pop albums since it crossed our radar a few weeks ago. The album title is Luck from the incredibly talented Austin power pop band Wiretree. If you love masterfully crafted, infectious, melodic pop with vintage 60's and retro hipster underground influences, chances are you'll want to add Luck to your CD collection. There are so many wonderful songs on Luck that it was hard to pick only the three tracks we've presented here; choosing just one is nearly impossible. The LP gets better with each spin." "With the first notes of this album's opener, "Across My Mind," I was immediately reminded of Elliott Smith or A.C. Newman artists that prove you don't have to be loud to rock. But Austin-based Wiretree's mastermind, Kevin Peroni, stands just fine on his own, without the comparisons. A versatile multi-instrumentalist and songwriter, Peroni sings and plays most of the album, including drums, bass, guitar, and Wurlitzer. His smooth, friendly vocals are perfectly suited to catchy tunes like "Days Gone By," the driving "Rail," the minor-key assertiveness of "Information," and the Beatles-tinged "Satellite Song." Wiretree's second full-length album (after 2007's Bouldin), Luck displays a knack for melody and Jeff Lynne-style production." 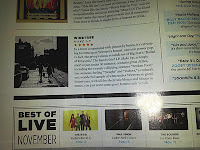 "Wiretree reached my radar with the first LP Bouldin, and with Luck, it doesn't hit a sophomore slump here. No, they hit it out of the park"
- Power Popaholic"With any Luck, this will be the disc that propels Wiretree before a much larger audience. It retains their signature sound yet broadens it to point where I could see the intelligentsia of indie rock and the poobahs at Pitchfork giving it a thumbs up if they take the time to check it out. Here's hoping they do"
"Information" has a truly infectious melody that insinuates itself into your feet and your mind. It is the kind of pop tune that will make you want to go back and listen again. It's a "feel good" and a "Wow!" song. "Satellite Song" has the coolest barroom piano bit in the background. It's a little out of tune and sounds like it has been dropped from a truck to the ground. The texture this piano adds is infinitely better than it would have been if it had been just a straight piano. The tune is, like "Information," so infectious that it demands repeating. "This is a band that simply doesn't repeat itself. Introducing one song as a callback to the first record is hardly necessary, because the sense of progression in Wiretree's music is so easy to hear. That early tune uses simpler chords but tricky rhythms while the material from Luck adds precisely composed melodies from both guitar players. In Peroni's compositions the band never goes for more than eight bars without something changing dramatically; in the rare instances that the guitars don't change to something new and interesting the drums will pick up the slack. The basslines aren't busy but they're never duplicating something the guitars are taking care of already. In short this is music that's completed, the work of a composer who sweats over every detail in the manner of a sculptor or novelist. For those remaining few local music fans who are listening closely, this is a gift." "The quartet - led by singer/songwriter Kevin Peroni - make clear, melodic pop music, borrowing bits from groups like The Beatles and Velvet Underground but with a modern indie rock twist. From crisp rockers like "Information" and "Back in Town" to the dark balladry of tracks like "Heart of Hearts," Wiretree sounds confident - and for good reason. The songs are well-written and the instrumentation sharp, with Peroni's smooth voice comfortably fitting into its niche." The six Peroni-produced tracks remind me of 70s Lowe. The three tracks produced by Lars Goransson are a bit more modern in feel, reaching forward into the late 80s. They provide a fine counterpoint to the punchiness of the other material. And on the whole, both sides of Wiretree come together to make a fine album. Peroni is a fine songwriter." "Melodic guitar-based pop that harkens back to some of the better underground pop artists from the 1980s. It is important to note that even though this band is currently treading in underground circles...their music is surprisingly smooth and accessible. Killer guitar lines abound here...as do super smooth, well-focused vocals. So many bands use gimmicks in order to get their point across...these folks don't. Straight-shooter pop tunes include "Across My Mind," "Back In Town," "Information," and "Heart of Hearts." Good memorable pop delivered with style." (Review of the single Back in Town) - "An undeniably upbeat pop song, channeling a 60s-era sound. The song will be released on Luck, Wiretree’s sophomore release. Entirely Wiretree’s own style pop, “Back In Town” has some subtle influences ranging wide and far from Velvet Underground to Wilco and beyond. Powerful guitar strums and an excellent xzylophone ring back passionate, emotive vocals; however melancholy, it’s hard not to get swept up in the catchy notes that keep this song powering forward. Smother Magazine - "Austin, Texas long a boon to the indie music scene now can boast Wiretree to its added collection of great exports. “Luck” is a dynamic songwriter’s dream with smart vintage and retro sounds of hipster underground pop."